– To make the eyes and mouth you will use the felt and the fabric paint. Finish off and leave a long tail. 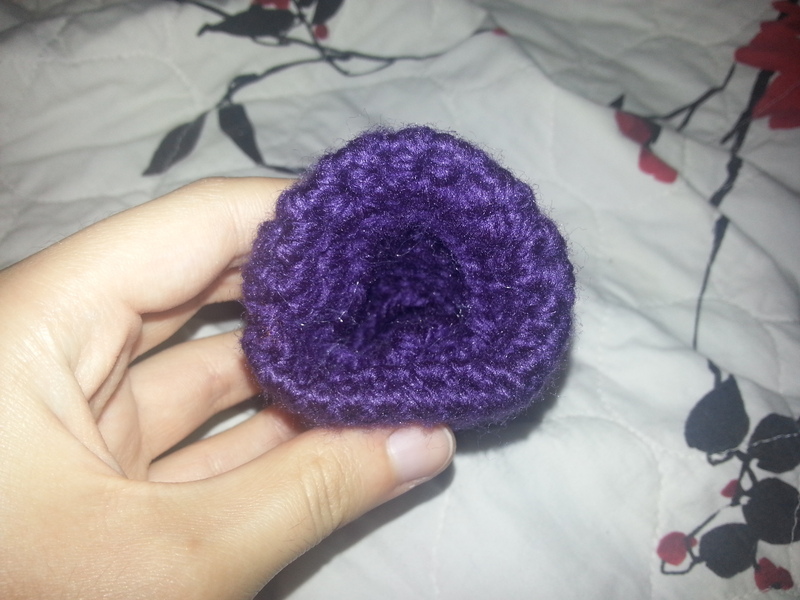 After finished, you should first sew it to the body and only after that you should fill it with the fiberfill. Then, sew his fingers to his arms. In next step sew his feet to his legs and the toes to the each foot. Finally, sew the legs, folding the tips, and the tail to the body. To complete it, you need to do his eyes and mouth. I recommend you to first do it in a paper and try to see how it look like on his face. When you get satisfied with the size and shape, you should cut the felt in the desired shape. Then, use the black paint to paint his pupils on the eyes. Before gluing the eyes to his face, you should pin them on his face with an adhesive tape and, so, sew his eyebrows. After that, you should glue the eyes. Then make his smile using white felt and the black paint and glue it to his face. I did not created this character, Gengar is copyright of Nintendo!! Hi,i am a little late to the party, but when do you start the fiberfill on the body of gengar? Thanks Mia! Between this and the Mega Charizard, you’ve helped me make two 8 year olds very happy! Round 26, do you mean 9 sc dec to get down to the required 60? I can make one for you if you like! How much yarn does this pattern require? It took less than a skein for me. I used Caron Simply Soft. how long did it take for you to complete? I’mean having huge difficulties in the leg…when I switch from round 8 to row 9, I understand that I just proceed with row 9 after I finish round 8…then do a ch, n turn to do row 10..but the problem is…I ended up with somewhat of a open ended piece…somewhat like a blooming flower with one edge higher (due to the rows) . That’s exactly how the leg is supposed to be 😁 When you attach the leg the taller side will be on the outer side of his body and the shorter on the inner/under side. This way he can stand on his legs with the help of his tail. Ohhh!! Omg. Thank you so much Deb! Really appreciate your reply!!!! Sorry ..but it says to fold the tips of the legs before sewing it on..which tips do I fold? I’m having a super hard time on the eyebrows. They just are so small that they aren’t working out. Any words of advice? I had the same issue! For the decreases, I just skipped 1 stitch and that helped, but I think I am going to try and rework them in rows and sew them into the tube shape after. It’s just so hard to do a round of 3! Are you using the smaller needle? Hi Mia, just wanted to check if there is a typo on round 26 for the body. Should it be 9sc, Dec (60)? I’m getting little circular knots for the eyebrows. Am I not supposed to work in circles on them? Thank you so much Deb! God Bless You and thanks again! Dec means decrease, crochet 2 together. Anders hdc means half douche crochet. I don’t know how to explain in English. Maybe YouTube will help? Hi! In rows 8 and 9 it starts with 27 st and ends with 20 but doesn’t have any decreases? Es hermoso,muy agradecida a vos por publicar el patrón,prometo cuando lo termine adjuntar tu link para que vean quien lo creó. When you go from rounds to rows, like on the spikes on top of the head, do I start my row where the round ended or do I turn and start the row “on top” of the round I just finished? I’m a beginner and taking on a rather ambitious project in this Gengar for my husband, but learning a lot! Hello! The arm goes from round 10 to 12. Where did 11 go?? Please let me know how to resolve this. Thank you! Hi!I don’t understand round 14:-( How so I get to 24 Stiches? Hello Mia! I am trying to crochet this for my husband but I got a little confused on the arms, on rounds 15-17, what does “sl” mean? Thank you! in the patter MR what does that mean? 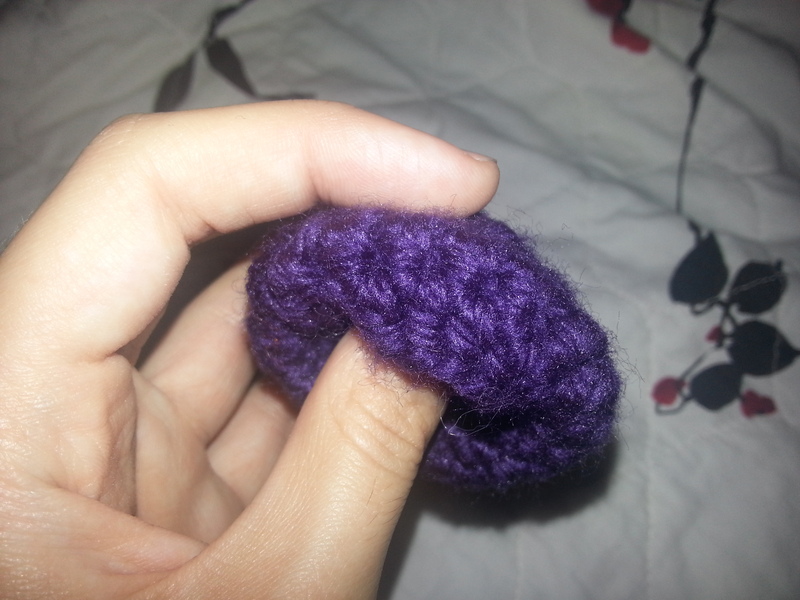 Hi, I just found this pattern… MR means Magic Ring or Magic circle. On the arms you jumped from round 10 to round 12, what do I do for round 11? When two rows say sc 4 and the last row said sc 8, do I sc 4, then turn and sc 4? Is that the trick? How do I go from 8 to 4? Or am I reading this wrong? To increase you put 2 single crochet in each of the four stitches and that will give you the total of 8 stitches to work with on round 4. You’re going to turn after last round of 8. Stitch 4 sc, turn and stitch 4 sc in prev row’s 4 Sc. where does it say turn? am i supposed to be turning on all the spikes because i did not. On the feet, the pattern goes round 4-6 to round 9. Are there rounds 7 and 8? Hi, did you ever get a response to this? did you figure this out by chance? i have been wondering the same thing and am stuck on the feet part because of this. does anyone know the answer? How tall was the finished Gengar? I love the pattern but the row 17& 18 foe the tail confuse me.. help me!!! I think you change from round to ROW 17, hdc 9, chain 1and turn. Continue with ROW 18: hdc 9. Can you pretty please do a Mewtwo? I know someone else who made a free pattern (Ah creations ) but I think if you did it he would look epic! I meant to say, even more epic! I love this! It looks exactly like him! Keep up the awesome work. Hi Mia, I’m new in crochet and I decided to work on your pattern… But I don’t understand the difference between ’round’ and ‘row’… For example, when I’m elaborating the legs, after round 8 goes row 9, and it decrease 7 stitches… So, how can I elaborate this?? 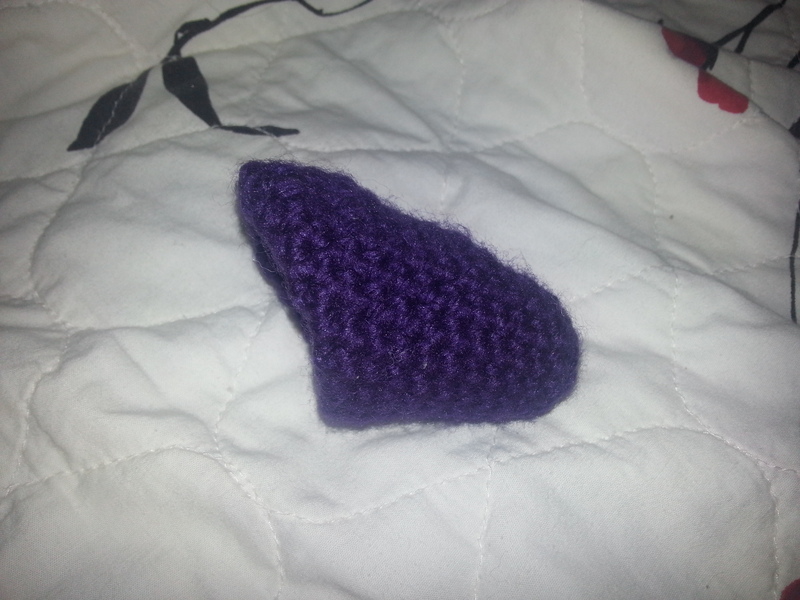 When you finish the last Round don’t do anything special, just continue crocheting the stitchs of the first row. After you have crocheted all the stitches of the first row, ch 1 and turn. Then go on xD It wont go up all the legs anymore, but just a piece of it. You won’t decrease to make it. ** You are going to work in rows from Row 9 on. When you finish the last Round don’t do anything special, just continue crocheting the stitchs of the first row. After you have crocheted all the stitches of the first row, ch 1 and turn. Then go on xD It wont go up all the legs anymore, but just a piece of it. I wanted to crochet the whole face. I got the eyes done but I’m not sure how to do the smile? Do you have any suggestions for a pattern? Hi Mia! That’s awesome! I Love the idea of the bag with pokeballs and a big masterball! Hi, I’ve been working with your pattern and I’m confused as to how the legs are supposed to be attached to the body. The folding part of the legs confuse me. So do I fold the rows inside the leg? because right now it looks nothing like your model. It’s like they are way wider and not long enough. I would appreciate a detail view from under Gengar. Because so far it’s the only part I don’t quite grasp. When you finish Round 8 you continually start Row 9. Then, when you have done the last stitch of row 9, you will ch1 and turn to start Row 10. 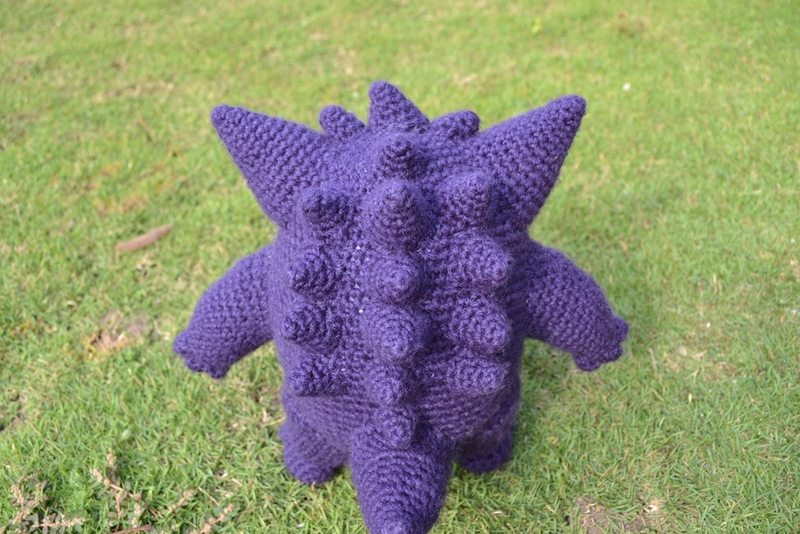 Anyone know where I could find a good Gengar HAT pattern (crochet or knitting)? Sorry, I don’t know any >.< You may try to look on ravelry, maybe there's something there. Couldn’t you just do a purple hat follow say, Sarah from RepeatCrafterMe’s basic hat pattern (http://www.repeatcrafterme.com/2013/01/crochet-puppy-hat-pattern.html) and then if MiaHandcrafter is okay with it, use the spikes and facial details from her lovely pattern here to make it? Sorry it was just an idea I thought of when reading this! I adapted this pattern into a hat…Will post pics soon…Gengar is my son’s favorite! Hello! I love this pattern but I’m having a problem with the stitch count on round 20. i keep getting 66 stitches rather than 64 and i was wondering how you did round 20 and got 64 stitches? I’m sorry about that :S I mistyped, the correct it is 66 stitches. I’m glad you love it! I’m sorry about that :S I mistyped, the correct it is 66 stitches. Hi…love the pattern so farm.Im having trouble with the eyebrows..mine dont seem long enough..they are more round..are they done in round or row? I’m glad you love it ^^ They are done in Rounds. I made them very tight. You are very welcome!! ^_^ I would love to see a photo, when you finish! I noticed that Round 11 is missing, was that just a numbering error? Also, what is “sl” is that slip stitch? Thanks so much for this pattern. 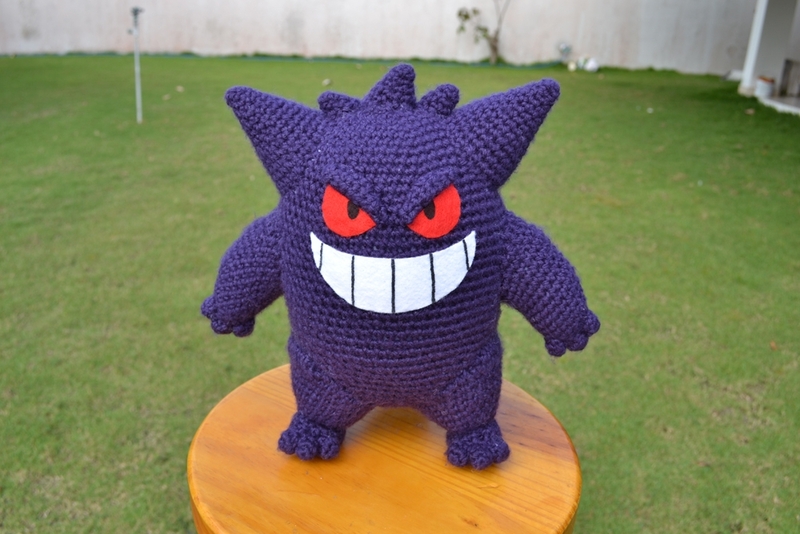 I also am making this for my boyfriend – Gengar is his fave poke – there’s definitely a pattern! I just wanted to please ask you for some extra help. I’m having loads of trouble trying to sew the feet to the legs and then working out what angle I have to attach the legs to the body. Can you please let me know what angle I need to sew the feet onto? 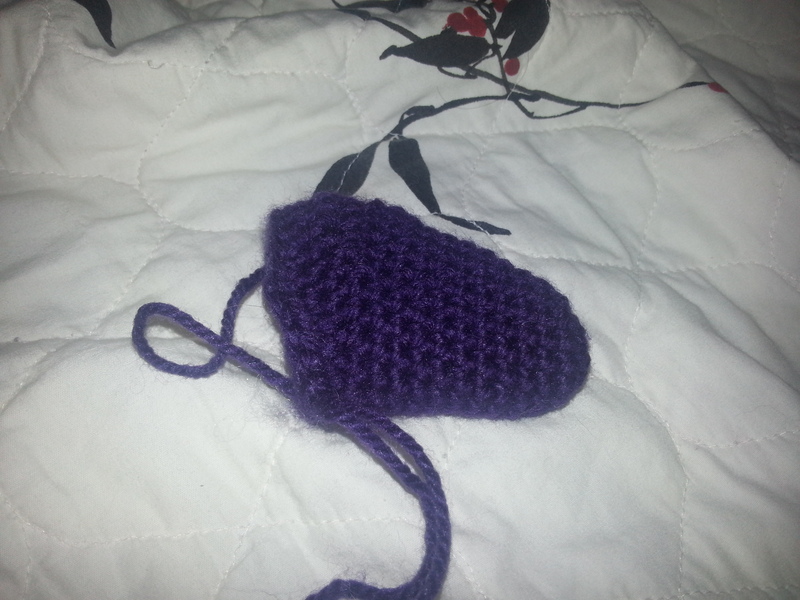 The legs are sort of trapezium shape and all slanty and I can’t figure out where to put the fold. Hello! I’m currently making this and it’s looking great! I have a quick question though: For the last two rows of the large and small spikes on the top of the head, did you mean that I should sc 6/4 then turn and sc 6/4, or maybe slipstitch 6/4 then sc 6/4? Otherwise I’m not sure what the difference would be from just sc around ^_^;;. Just want to make sure I get it right! Thanks! Thank you for your reply! I didn’t notice that the pattern changed from “Rounds” to “Rows” so that makes a lot of sense! I’ll definitely post a photo of Gengar when it’s done. Thanks so much! What is it with boyfriends and Gengar? I will certainly be using this pattern for my Poke-guy. Thanks so much for posting this! 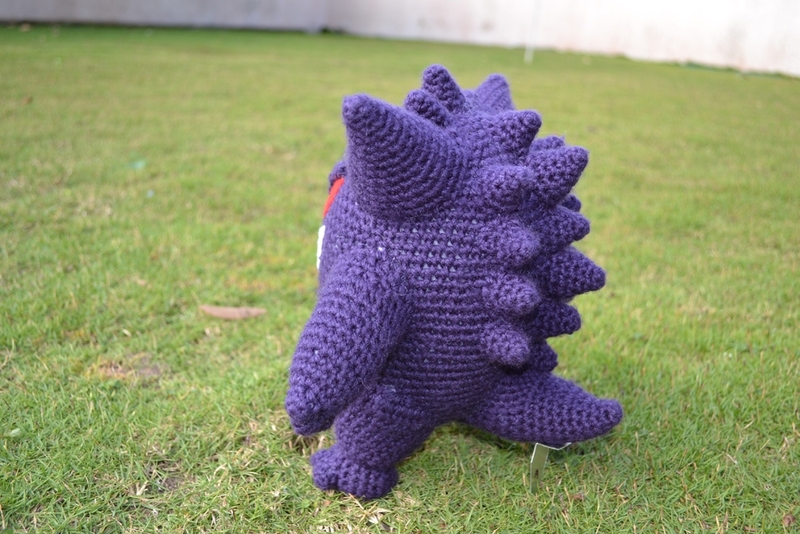 A good way to learn some things about crochet is to search on Youtube, there are a lot of very good tutorials in there ^^ If you need any help while doing gengar, feel free to ask me. It will be a pleasure to help.